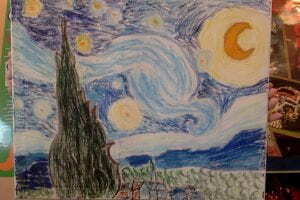 Hello, I have successfully completed the starry night by Vincent Van Gogh with oil pastels, however when I came upon the mosaic I thought HMMMMMM Why make this pattern when I can make whatever I want. 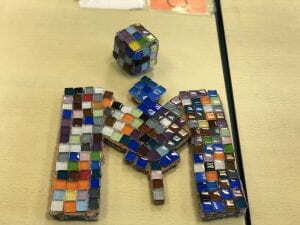 So I decided to make a M Symbol and a cube, it looks really cool. Some problems I encountered were for the oil pastels they smudge a lot so that kind of ruined parts of my painting and for the mosaic I sometimes burn myself with the glue gun but otherwise its not that bad and it was a good experience after all. Yay super artist tactics.